Jodhpur “the blue city” in India submitted to ‘From Above’ on National Geographic. Kristian Bertel has contributed to the National Geographic Your Shot photo community with an assignment called ‘From Above‘. Curated by Marie McGrory, an assistant photo editor at National Geographic, is focusing on the appreciation for the art of aerial photography and how we apply heights a bit closer to the ground. Marie, who once taped her camera phone under a high cabinet to take an image from above. She wants us as photographers to take some safe and creative photos from above in ways where we as photographers can get and interesting angle. Right now, this assignment only has one rule as Marie McGrory is writing, that we have to look down. Whether we are looking down at our feet, from the top of a building or from an airplane, National Geographic wants to see how our world looks like from above. Aerial photography is the taking of photographs of the ground from an elevated position. Usually the camera is not supported by a ground-based structure. In some digital cameras for aerial photogrammetry images from several imaging elements, sometimes with separate lenses, are geometrically corrected and combined to one image in the camera. Aerial photography is an important artistic skill. A lot of the world’s most interesting patterns are only apparent from the air. There is only one thing that aerial photography seldom works for, to convey the experience of being up in the air. When you are sitting up front in a light plane or helicopter, you look up at a panoramic view of open sky. You look forward and sideways at a 180-degree stretch of horizon. You look down and see interesting features on the ground all around you. Contrary to theories put forward by some scientists, the Earth is actually quite flat. Aerial photos taken under midday conditions when the sun is high look very flat indeed. It is best to fly in the first or last hour of the day, when the sun’s angle will produce shadows that enable viewers to understand the shapes of the hills and structures in a photo. The contributing photographer Kristian Bertel took a picture of Jodhpur from above. Jodhpur is second largest city in the Indian state of Rajasthan and has long been a popular destination among international tourists. However, surprisingly few visitors know the origins of its sobriquet, “the blue city”. A winding lane leads up the high hill, on which the ancient fortress is built. 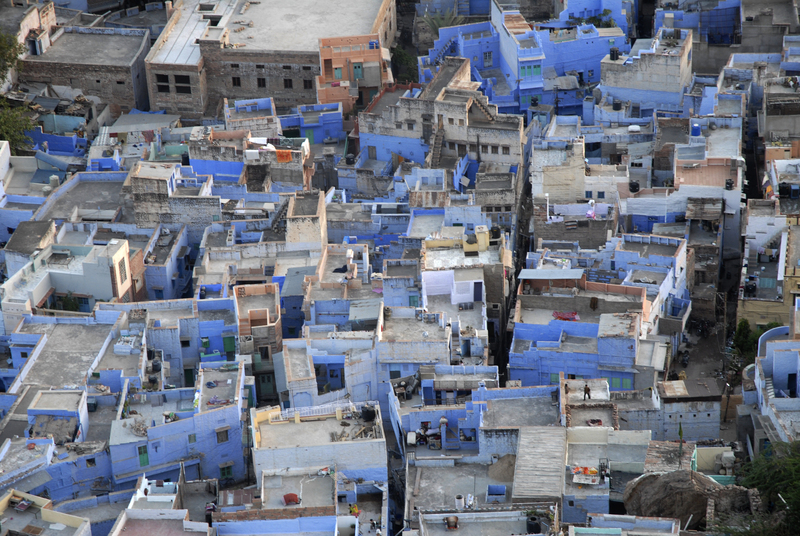 From there you can look out and appreciate just how many of the houses in Jodhpur are blue. Not all cities deserve their sobriquets, but anyone looking out over the flat roofs of Jodhpur, from the perspective of the Meherangarh will realise that the term “the blue city” is indeed apt, whatever the true reason behind the prevalence of that color. Jodhpur is just one out of many places that the photographer visited in Rajasthan on his first journey to the subcontinent of India. ”– This photograph with its blue scene of houses taken from above in Jodhpur were among some of my most memorable travel moments from my first journey to India”, the photographer Kristian Bertel says.